Consultant Nephrologist at Manchester Royal Infirmary and the clinical lead for the renal research team at MRI with major research interests in phosphate, calcium, parathyroid hormone and vascular disease in patients on dialysis. 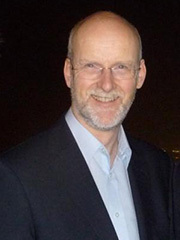 He is chair of the UK Renal Association’s Clinical Services Committee and a member of the Clinical Affairs Board, and chair of the UK CKD-MBD Clinical Studies Group. I qualified from Birmingham Medical School in 1983 and was a registrar in Renal Medicine at Charing Cross Hospital to 1988, then Research Fellow at MRI to 1992. My MD was awarded in 1993 for research into calcium and phosphate metabolism in peritoneal dialysis patients. I was appointed as consultant and Honorary Lecturer in Medicine at MRI from 1995. I became Renal Unit Clinical Director in 2001 and over the following 9 years supervised the merger of Withington and MRI renal units, and the doubling of haemodialysis spaces in the south-east half of Manchester. In 2009 I took on the role of Associate Head of Division of Medicine and became head of Division in 2013. Medical Student ‘Problem Based Learning’ Key Teacher, and member of undergraduate curriculum group. Member of NW NHS Clinical Leaders Group. Internationally recognised research in dialysis, phosphate and calcium metabolism, lanthanum carbonate, with 80+ publications and several book chapters. BJRM award in 2002 ‘Innovation in Renal Medicine’. Restructured and expanded ‘Pre-dialysis’ and ‘Home Haemodialysis’ services. Co-author Greater M/cr Renal Strategy 05-08 and 08-11. Invited “Expert Witness” to NICE committee 2006.